I don’t know if I would have been able to write about Darrel Chaney if his hard-nosed talents had been better represented by the photo on his card. I realized today that one reason I have written relatively few profiles of Cincinnati Reds players from the 1970s is that I can’t really relate to excellence. So Chaney, a tough, humble, do-anything-to-help-the-team-win utility guy on a couple pennant winners and a World Series champion, would leave me nothing to connect to had he been shown in a photo bravely turning a double play despite the marauding spikes-high efforts of a baserunner. But that is the beauty of my Cardboard heaven. All become strange and failure-laced. Here Chaney stoops like an arthritic amputee with one freakish arm as long as his legs, his eyes mean slits, his skin pale, his lips thin and sour, like those of a corrupt medieval bishop. He reaches for an imaginary grounder, not getting in front of it. He reaches for his shadow. It eludes him. He reaches for his name. He’ll catch a shred of it, the top loop of the D, but no more, as it slides past him and disintegrates. He will remain forever on this side of the white chalk line. 1. Darrel Chaney in a recent photo taken at a restaurant called the Beef Baron. 2. 1 : He seems to have grown a right arm, perhaps thanks to all the beef. 3. Damn, he looks older than 60. He played in the ’75 WS. I didn’t know that. 4. Is Darrel Chaney related to Dennis Blair? 6. Al Michaels made a big issue about Chaney’s contract: apparently, he was the only player (back in the pre-FA days) who negotiated into his contract that the Reds would pay for his college education after his playing days were over. It would be funny to turn over a card and see a player described as “a leg man”. 8. Chaney actually was the same age and came up at the same time as another SS with the initials DC, Dave Concepcion. And for the first couple of years it wasn’t clear that Davey was going to hit any more than Chaney would. In ’72 Concepcion figured it out with the stick enough that he got a stranglehold on the job and was on his way to a borderline HOF career, while Chaney never did and was kept around only because he could play 3 infield positions well. Something similar happened with the Reds in ’87 with two young shortstops. One, age 22, hit 258/316/375. The other, a year older, hit 244/306/371. The Reds traded the first guy, Kurt Stillwell, and kept the second guy — Barry Larkin. Don’t know if I have a point, other than the old one about hindsight. 9. 8 : On the subject of the Reds and who to keep and who to let go, I just heard on the radio today that the rationale for letting Josh Hamilton go was that it would open up space for Jay Bruce, so I guess the Reds were sizing up the relative merits of those two. Both are looking pretty great, which I guess raises the painful question, Why couldn’t the Reds have had both (and not Cory Patterson)? 10. Darrel Chaney puts on his “corrupt medieval bishop” face for his 1975 card. That cracks me up. Can you tell us what the photographer was asking him to do for that shot? 11. Darrel Chaney went to my high school about 25 years before I did. I think he was a star athlete in baseball, basketball, and football, so he had his picture up on the walls near the gym. Somebody had this card, so we kind of knew who he was. The only other names on the wall that we recognized were the ones who became teachers or parents at the school. I wish I had either A) access to that information, or B) the imagination to come up with a plausible hypothesis. The pose seems like a cross between a pitcher follow-through pose and a more-awkward version of Terry Harmon’s (see link in sidebar under Phillies) “waiting to make the catch and apply the tag” pose. 13. The request was probably “act like you’re backhanding one in the hole.” But Darrell’s heart clearly wasn’t in it, probably because it’s about 8 am (check that shadow) and he’s hung over. Presumably, because trading Hamilton allowed them to have both Jay Bruce and Edinson Volquez. 16. 15 : Good point. I was ignorant about the particulars of the Hamilton deal, which is so far looking like a win-win. Two of the big powerhouse teams when I was growing up and getting my first sugary taste of CBGs in 1975 were of course the RedSox and Reds. But as I stated under Terry Hughes, I never got any name players. 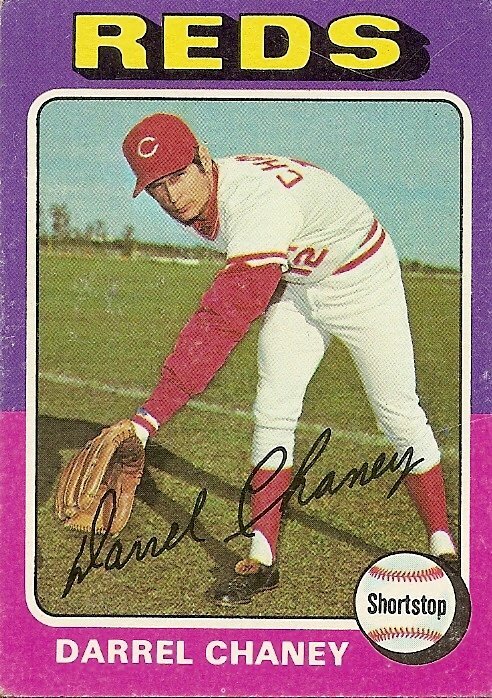 My connection to the RED’s at that time was Terrel Crowley and this Darrel Chaney card. I thought they must be good. The Reds are in first place. I think what draws me to the 75 set more than any other is the mystery of where the photo was shot. As a kid, something seemed ‘off’ yet kept my imagination spinning about the ‘backstory’ behind the cards. Take away the chalk line and this card doesn’t even look like it was taken in a ballpark. It looks like it was taken in a park or perhaps in the sunblessed warmth of some kentucky farmland. I really see no semblance of a field. If that is a fence if the background, it looks like a farm white picket fence and 2 propane tanks end to end. And the fence seems miles away. Darrell was probably in charge of getting all the balls at the end of the day that rolled way out yonder. It’s peaceful and serene. Darrel was one of us. Playing ball wherever we could find some open space. How hard up was Atlanta for a SS in 1976?????? This card must have impressed Atlanta. They traded Mike Lum for Chaney and he instantly became their starting SS, playing in 153 games. Only Larry Bowa played in more. He must have lost the good glove moniker because he led the league in errors. Probably the most interesting aspect to his non nondescript career is the fact in his last season in 1979, he played 1/3 of inning at catcher with someone stealing a base on him. Kudos to anyone who can find the boxscore and play by play for that one. I am distraught I can’t find the game. I went through all extra inning games and losing blowouts. Hmmm not all search engines are created equal. Did google and internal search on baseball ref and could not find the game that chaney played catcher. still had to scroll to find the game, but that just took a few seconds. I had to go back to basereference to get the pbp. I find it fascinating that chaney moved from 2nd to C. Dale Murphy who had plenty of C experience that season could easily had moved to C after PH for Pocoroba. Mazilla steals 3rd on chaney and scores on the next play on a trevino single to left. shows that game was suspended and finished on a later date. (third to first); 0 R, 1 H, 0 E, 1 LOB. Braves 1, Mets 1.
scored]; 1 R, 2 H, 0 E, 1 LOB. Braves 1, Mets 2.